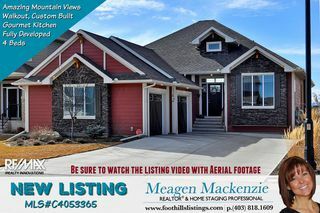 CLICK ON VIRTUAL TOUR TO WATCH THE LISTING VIDEO & AERIAL FOOTAGE OF THE AMAZING VIEWS! 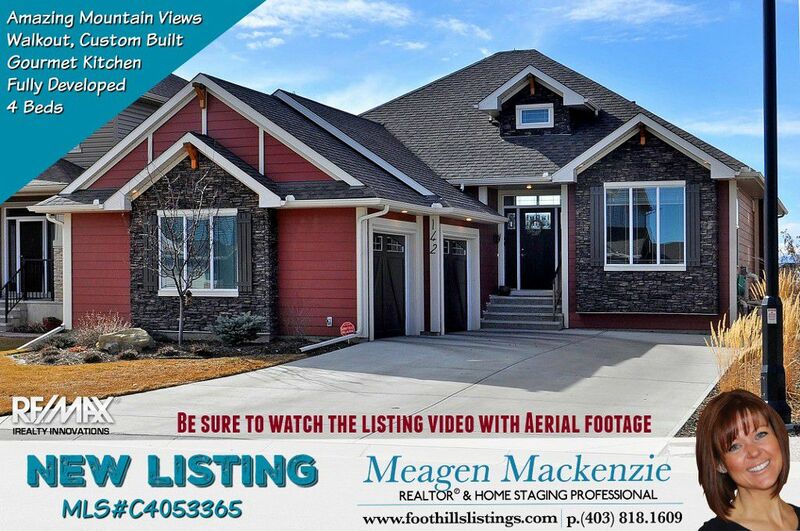 Welcome to this custom built bungalow overlooking a peaceful pond with AMAZING views of the Mountains, the Foothills & the entire town of Okotoks. With 2,959 square feet of developed living space, this stunning home has it all. Enjoy the fabulous views from practically every room in the house. Main level offers 12' ceilings & an open floor plan with a gourmet kitchen (complete with all the upgrades including a butler's pantry), the dining area & the livingroom, all looking out onto the mountains. Master bedroom is located on the main floor with private access to the back deck. The en-suite offers double vanities, a large shower, in-floor heat & a roomy walk-in closet with custom closet organizers. The walkout basement is fully developed with 3 bedrooms, a LARGE family area, laundry & tons of storage. 2 of the basement bedrooms are separated by a 5pce Jack & Jill bath that also has in-floor heat.See additional comments. 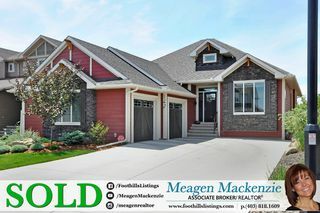 Walk out to the professionally landscaped yard that offers underground sprinklers and 2 separate patio's...one with a firepit, all looking out onto the peaceful pond. Other features include air conditioning, central vac, audio surround system, composite decking, brand new paint throughout, custom high end window coverings. Built by Lifestyle Homes. Original Owners. LOCATION, LOCATION, LOCATION. You'll never lose that view! View this Property Tour to get a feel for the home's layout, location and the AMAZING VIEWS.